Guide to iKnow! - iKnow! 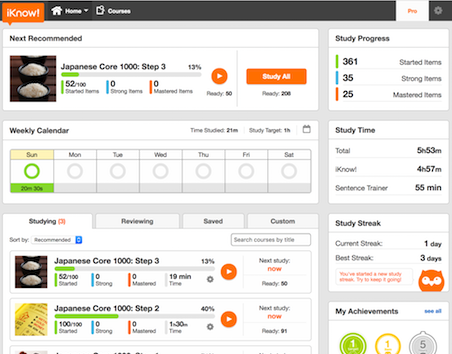 Here you'll find your next course recommendation, a handy button to study all your ready items, a weekly study calendar, study progress information, study time, streaks, achievements, and all your courses. iKnow! recommends what items you should study next. 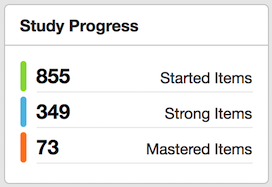 You can see how many items ready for review you have in a course or across all your courses. On your Weekly Calendar, you can see how much you studied each day of the week. Click on a day to get a detailed report of that day's activity. You can also click on the calendar icon (top right) to see the Monthly Calendar. Items are the basic learning blocks. They can be either words or phrases, and their translation. Items can also have sample sentences. "Ready Items" are items that are now ready for you to review. "Strong Items" are items still fresh in your memory that you don't need to study yet. iKnow! presents items in a spaced rehearsal pattern optimized for efficient learning. The training sequence is based on proven principles in learning science. Our system presents you with what you need to learn just at the right moment for you. The Memory Bank is the visualization of this process and your study progress. You can watch the progress of your items increase over time. Study All gives you a recommended mix of new and in progress items pulled from across all the courses that you're currently studying. Study All shows you how many ready items you have in all your courses. Study All is the recommended method of reviewing content, but you can also study on a course by course basis if you prefer. Only courses you're now studying will be recommended for study. Save courses for future study. Add courses from Saved to Studying when you're ready to start them. Completed courses are listed here and will come back for review. If you don't want to review them, simply turn review mode off on each course. How much time do you want to study each week? Set your target, and iKnow! will help you stay on track. 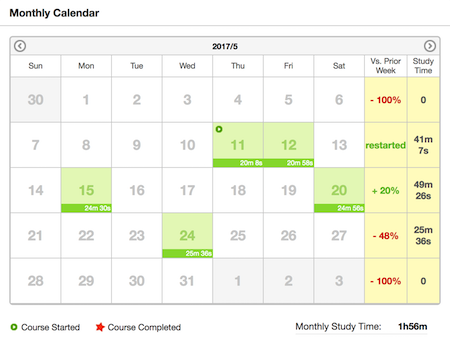 You can set your Weekly Study Target at the top of the Monthly Calendar page. Browse Courses to find a course that interests you, or take our iKnow! Placement Test to find the best place to start learning. 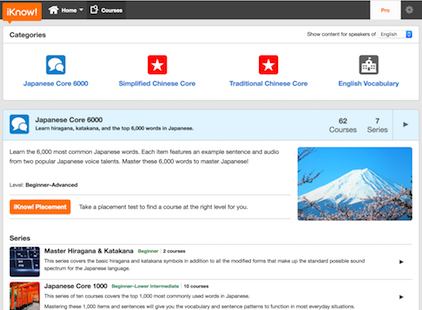 Our quick test will place you in a course in Japanese or Chinese that's right for your level. Learn hiragana, katakana, and the top 6,000 words in Japanese. Learn the words and characters necessary for reading Chinese newspapers in simplified characters. Learn the words and characters necessary for reading Chinese newspapers in traditional characters. Learn SAT words and high-level erudite English vocabulary. 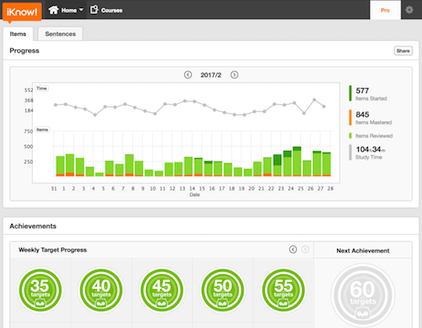 From the Home dropdown menu, select Progress to see your monthly progress across items and sentences. Graphs here help you visualize how much you're learning with iKnow! and different colors indicate items studied, items mastered, and time studied. Get achievement badges for weekly target progress, items mastered and hours studied. You can also share these achievements with your friends!